In late October of 2014, I came upon the writings of a fascinating Seer who goes by the name “Sparrow”, scattered throughout hundreds of pages in various threads on a forum dedicated to spiritual topics. I found his information so inspiring, profound, challenging, and thought-provoking, that I have been moved to compile it in this blog format, so that the reader may have an opportunity to explore it by topic in one designated area, uninterrupted by the various comments and questions of others in the original extended threads. “I am, in simple terms, a cosmic tourist attracted to the direction of human destiny. Firstly, the name Spirit Guide Sparrow represents a fragmented persona of my spirit. This is, it is a persona, for it is a role forged for a very specific purpose; to interact and create familiarity and association with those in human form. I am of course, and have been for a long time, a spirit guide within many different dimensions associated with the spirit world. I have worked as a spirit guide to those on many different planets, some as solid as the Earth, some as etheric in substance as the spirit world itself. Since not all planets have the density of matter as Earth does, or utilizes the same universal laws – should they be of another universe altogether. I have a long history of this. It is this persona, or title of reference I use on this forum to attach a sense of familiarity and understanding of my purpose for others to relate to. It is not one produced from ego – yet in a sense it is, for it is created out of desire from the identity of Self. You cannot exist as I, and not have an ego, for ego produces personality and desire. I could not call myself a spirit guide without a personality, therefore it is derived from ego. Ego derives from emotion, and emotion is beautiful. My actual name, which I will not print here, since it does not originate from any human language, is the actual name of my spirit identity. Though I go by the name of Sparrow for your association, I am actually known by this other name within my soul group of whom I represent. This group of which I am apart is called the Asceleottyi (pronounced a-sell-lee-ot). Our group primarily consists of beings from other parts of the cosmos, from other dimensions and other universal dynamics. If you meet me, or us in the spirit world, we are unlikely to appear human, for our affections lie in a different line of ancestry. 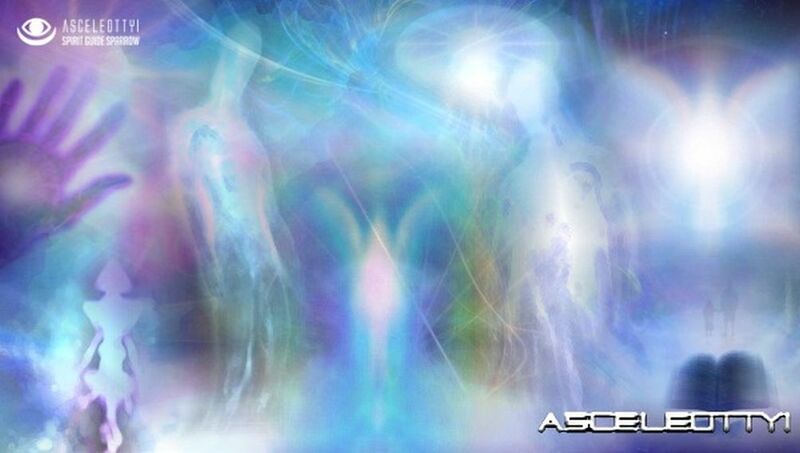 The Asceleottyi are the vibration, the intention and the very soul identity of that which I am. They are all that is good within me, all that I aspire to be, and bring light where others cannot see. They go where others cannot, and know not, bearing wisdom and knowledge from worlds, from dimensions and from realizations beyond the perceptions of others. They bring galactic species, both ancient and adolescent together through the illumination of truth, of history, and of nature. They are observers, they are the watchers, and they are the facilitators of perspective, of morality and mentoring civilisations. They bring the wisdom, the values and the historical lessons of worlds and species to one another by facilitating communications between them. They are ambassadors for voices of council that know no physical form, that in themselves create universes of their own, in their own image. They are voyagers and explorers of both time and space. They are caretakers and care givers, they are guides and mentors of progress, of change and of evolution. They are your friend and mine. They are the Asceleottyi. As for what I do as this identity is engage contact with many, many different species, in my different realities and observe, collate and collect information and knowledge and process this information into other formats of understanding which other people, other beings, may comprehend and understand. This information, awareness and perceptions I provide for others assists them to gain access to more of their own potential. While in human form this information will be presented in the form of images, feelings, healings, music and words. It will be translated through my wisdom and my love. I also have other roles and perform other duties of service, which are not associated with human beings. My time and travels within the spirit world have been extensive and penetrating; my roles and commitments have been many. The Asceleottyi to which I am apart traverse many frontiers of many different realms in order to communicate with different beings from different origins and backgrounds. We observe many different species on many different worlds and collate information, experiences and lessons from what they have gone through, then translate this information to many other beings in different realms that their influence may weave threads of wisdom and wonder throughout the halls of information and beyond. This is one of my functions in the spirit world, and this is my function in providing you with new streams of thought and new opportunities for a better future for your children. I provide answers to questions that you may use the information I provide to better protect you and your loved ones, and to better harmonize your relations with other species, as well as your planet. Now in terms of the physical side of the coin, in whichever way you wish to relate to me on, I have lived a pretty common life symmetry to anyone else. This is to say, I had quite a challenging childhood. It was very difficult to be different, and spent much of my time sobbing and projecting my rage into the stars from whence I came. So infuriating this was, so painful, and so alone I was, that I was brought to take my own life, simply to join with my beautiful spirit which I felt so separated from at the time. Though I did not die, for death could not touch me. What I was left with was stillness and silence of mind, of heart and soul. All questions became irrelevant. All desires became inconsequential. All fears became illusive. I lost my persona of who I was, for it was no longer important. Here then followed a clarity of mind, a peace of heart, and a union of soul and spirit that was to propel me into dimensions of awareness, wisdom and profound love I had never anticipated. From there till the many years that followed questions that arose became answered by themselves. Till a point came when no more questions could be formed, for so swiftly did such answers come that questions were no longer necessary. This was the act of be-ing that which I knew. Knowingness comes to those who no longer question, but simply allow life to speak for itself, on all matters, within all things. This is the beginning of selfless being. When you are not attempting to be some thing, every thing becomes your experience. So it is then, having glimpsed into infinity upon my surrender of mortal life, who I was before ceased to exist thereafter. In the state of existing purely as an observer and witness of creation I allowed myself to be open to all that I was beyond the glimpse of my mortal parameters. My pure intentions of love and joy for the experience of witnessing life in motion raised my vibration of perception, over time, to such a degree that knowledge and understanding came upon me in many different languages beyond words. In a sense, this language took me some degree of time to observe and understand. Within the state of distillment and within the surrender of my awareness to infinity I observed answers that came from a source without persona or identity, from many different perspectives simultaneously. I was then able to apply any one of these perspectives to any given circumstance to explain its purpose or function. It is also so that one of my own spirit entourage, if you like, is an energy facilitator who works to enable me to transcend human consciousness and polish my vibration. He is a healing mechanism if you like. Also those of my soul group are responsible for aligning me with information within different formats of language, which I then present to you within the human language. It is not that I am channeling another being, but that they help to facilitate a mechanism in which information from my spirit is downloaded within me. This was part of a process, not an immediate transformation; for this would be impossible in human state. So this is who I am. In brief. As for where my information comes from: To truly connect with deep seated awareness you must arouse your own knowledge and wisdom within you by allowing information to come directly to you. My alignment with spirit is somewhat more intimate and deep rooted than perhaps others are. You could say, in a sense, I have the capacity to gain access to and download information efficiently from my primary state. Though this is pretty much what I have been doing within the spirit world for a long time, so it is perhaps easier for me in that regard. Most every aspect of my physical life is motivated and energized by my deep rooted spiritual awareness. If one is willing to live their life with such focus and purpose then so too will they gain access to understandings of profound importance. I have reservations in using the term teacher to describe a spirit guide. The term teacher often attaches hierarchical connotations. Guides are not really there to teach you something, but to illuminate a path forward in relation to whatever potential it is you yourself aspire to pursue. They are there also to bring into your awareness new directions of thought which help you escape repetitive cycles of experience. I would prefer the term facilitator. Whether it is – a facilitator of healing, of creativity, of information or whatever. I particularly like the term facilitator of direction. Those who read of these words, who through their heart wisdom resonate a sense of connection to them, forge little umbilical threads of energy through the nectar of their influence. As I present my energy, my intention and my perception within this language its influence is registered within Akashic memory. This means everything I cause you to feel, to think and to perceive returns back to me in a registry of vibration which permeates every single cell of my being. 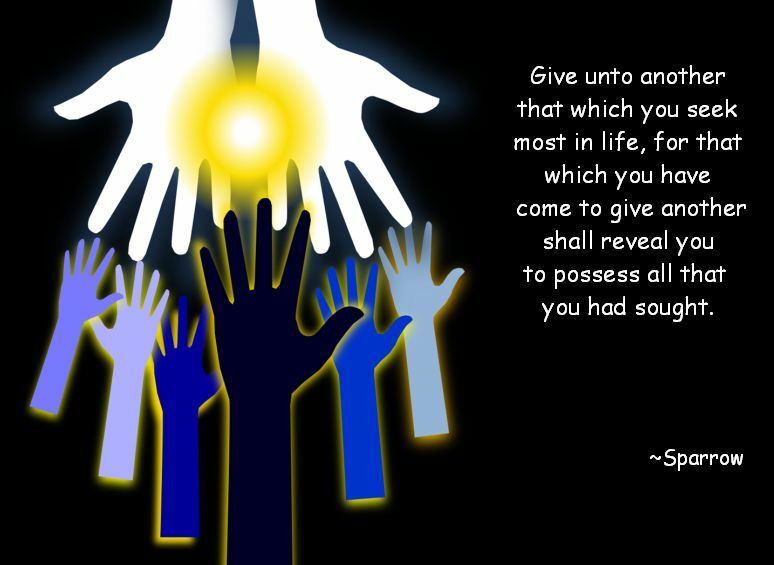 This is why my message for all to regard one another with the utmost love and upliftment, regardless of difference in opinion, is so very essential to your soul. The approach of how one connects to another via their words has far reaching influences for both parties. Am I aware that individuals are grateful regardless of their responses? Yes. I am aware of quite a few things. I am aware of those individuals who cultivate such value in such words that they copy them down onto their personal computers and papers. I am aware of those who repeat my perceptions to others. I am aware of those who contemplate the implications of such words and who then connect with the spirit world through an alternative perspective. I am aware of those who reach out of me in their meditative states who wonder if I am listening. I am aware of those who have shed tears and those who have taken their beloved pet for a walk while continuing with the connotations of such words. I am aware of those who have set about creating their own communications and personal presentations based on my own. I am aware of readers whose spirit guides and doorkeepers perch upon their consciousness as they conclude their next response in mind. I am aware of those who read such words who both hesitate and hold caution to present their own question or conclusion of perspective. I am aware of those who contend me to be aligned to some egocentric condition or assigned to some self-afflicted delusion of grandeur. Above all, I am aware of my own gratitude and grace through which I receive such privilege to touch and be touched by so many beautiful souls as those who read these words. I, as are we all within this soul group, are astutely self-perceptive within our capacity for reflective thought and revelation. Little needs to be said for the many benefits attributed to a reflective and Self-aware consciousness, for in their nature do they speak for themselves. I do not perceive myself upon a ladder of evolution, as perhaps you may describe it to be, for this is not of the vibration to which I am apart. Evolution, as so many human beings place it, aligns to hierarchical thought processes, which in its human design does not represent the true form of the omniverse. It is my reflection then that I share with you that I am not upon a path of spiritual evolution, but one of human destiny curiosity. That is, I am in simple terms, a cosmic tourist attracted to the direction of human destiny. My capacity of Self-reflection then is not one aimed at achieving some form of spiritual growth, but to expand my capacity to understand human nature, and the nature of planet Earth in general. This is not a product of some lofty position I seat my perception in, but simply that I have let go of my own story, my own need to have specific identity or personal outcome, that matters of ‘I’ or ‘me’ have become mute. I will make use of a specific persona in order for others to relate to me, but this persona is a temporary vehicle. What becomes of it is not really of any importance, only the values and thought processes I awaken in those who receive my words. My soul group have a very extensive and penetrating presence, with access to many different dimensional realms, different universal platforms, and realities, that to the human mind would seem like fantasy. Due to our vibration as an archetypical family we prefer to adopt form that does not occupy what is considered the third dimension. This ‘third’ dimension is quite confining to us since our energy flows more akin to the nature of water and air. Walking on solid ground feels somewhat alien to an extent, and our movements are more attuned to that of the dolphin. With this said, the percentage of us on Earth is absolutely miniscule. I came to acknowledge myself as a guide through my own ability and capacity to become my own greatest guide. In all aspects from relationships to physical, psychological and emotional health, to the deepest questions of the universe, my own capacity to acquire wisdom through multiple layers of intuitive reflection, inner inquiry and outward perception; I have been my greatest guide. This innate ability comes from my development and individual capacities within my specific soul frequency of Asceleottyi to which I am a part. 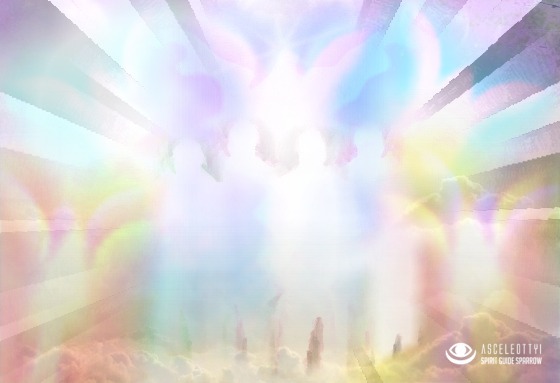 As part of my extensive activities within the spirit world my attraction towards the accumulation of knowledge, combined with my relations with many other entities and multi-dimensional beings, has placed me in a position to access many layers and formats of information, of energy and perception which I bring forward to you. On this convenient internet platform I hold the persona of Spirit Guide Sparrow, though this is not the entirety of who or what I am, it is a suitable persona others can more readily relate to in a spiritual culture. I was not born into a spiritual family, and as such my process of remembrance of Self-realization only occurred through my own self-driven will and persistence. My arduous and most challenging adolescence only worked to reveal my true strength of character, of will and courage. My independent development and self-trust has meant that I did not become captured by the spiritual belief systems that readily conflict and confuse modern society. My spiritual self-reliance and progression towards beings outside of the physical, human or Earth influence allowed me to rediscover, very quickly, my true nature and perceptions and perspectives outside of the human vantage point. This has granted me a more unbiased universal and inter-species perspective on a great deal of questions and observations. I will not hesitate to share what I know with those who genuinely seek to develop their understanding. It is only necessary to keep one’s own spiritual inclination private if they still live and choose through fear. I am most grateful for your willingness to share Sparrow’s work with us here in this format. I’m curious to know how Sparrow’s insights have changed your own? Would love to hear your thoughts! So glad you find this blog of interest! When I encountered Sparrow’s writing, I felt it would be a great benefit for others if it was shared in one location, sorted by topic. The response has been very positive, I am happy to report! In terms of the effect his writings have had for me, I would say that they have mostly re-affirmed what I have previously discovered, with some delightful twists too, particularly in regard to clarifying the differentiation between soul and spirit, and the mechanism involved in taking birth here, especially as it relates to free will vs the traditional concept of karma. Moreover, I am also grateful for his clarification on ET agendas, as well as the origin and fate of humanity. It’s wonderful to get the perspective of the bigger picture spelled out in the kind of detail Sparrow has done! Mahalo for your response, Brother, and for sharing the particular effects his writings have had for you! I’ve experienced similar effects and am incredibly grateful for Sparrow and you of course for your efforts in organizing and sorting the information to make it more easily accessible to us! Thank you Bob. My kindest thoughts go out to dear Sparrow, and to you for sharing his words here. Many blessings. You are most welcome, Lovely! I feel very grateful to be able to share these materials with you and all, Dear Alisha! How is it that you came across his writings? I get a report on my WordPress blog of where readers are located i.e. if someone is linked to google, or another blog on wordpress, or some internet forum, etc.. Anyway, about a year ago, I found that someone from a spiritual forum had linked to my blog, so I traced back the link and found a very large message board forum dedicated to all sorts of spiritual topics. I found one subforum dedicated to NDEs, which is an interest of mine, and it was there I discovered Sparrow. He has long since stopped posting at that site, btw. I noticed that he returned for a few months last year to the forum where he had been posting, but has since not been active. I did add his recent comments as an addendum to the relevant topics here (in the comments section beneath each essay). I am so grateful to you for posting these articles by Sparrow. My soul has received so much healing from reading the articles on Soul Groups, Soul Mates, Reincarnation, and Planning Future Lives in particular. Such a burden has been lifted off of my heart after reading these. You have done such a great and important spiritual work by compiling these articles. If it were not for you, I may never have found Sparrow. I would like to thank you and Sparrow deeply for assisting me on my spiritual path. I love how he said he is aware of those touched by his writings. I am one who strongly resonates with them. I believe that your Guides and Soul Group members are very proud of you Bob! So glad to hear that you have found inspiration in these writings! Thank you for sharing that! “My association with past identities have had more to do with star systems and species elsewhere in the cosmos and of other semi-physical states of reality. My purpose to incarnate has never been to learn lessons. The lessons had in a sense already been learnt through the observation of both primitive and advanced cultures on many planets over many thousands of years. Having documented my observations and assimilating the accounts of other sentient observers from other dimensions of perspective, these lessons have been accessible to many millions of species in the halls of information. These lessons have more to do with the survival and advancement of cultures through the many challenges, obstacles and interferences visited upon them through their development. Many once prominent and unique cultures have ceased to exist in the physical domain because they have not had access to, or acted upon knowledge and wisdom from historical warnings. The human species in this regard is considered to retain a very poor capacity to learn from past historical references and seem bound to repeat the same mistakes in their relationship to Earth, to the protection of flora and fauna of the Earth, and to each other as a society. I’m intending reading as much as I can of Spirit Guide Sparrow’s guidance you’ve compiled. I’ve also started reading SGS’s own website. Will there be much duplication of material in these two packages? And are you still compiling to present date? I notice Sparrow hasn’t been around much on Spiritual Forums this past few months and wondered why that is – do you know why? I do not think there is much duplication between the 2 sites. Sparrow dropped offline shortly after I compiled the materials, and then reappeared briefly last year for a couple months, but has not been heard from for a while now. I am glad to hear you find the materials to be of value! Oh and a big “well done” for doing what you’ve done! The thread Sparrow started on SF website years ago is enormous and removing member-comments, plus ordering and grouping, leaves the most important material accessible. I remember when Sparrow started but never thought the thread would continue as it has. thanks for your swift response – Do you plan on continuing to log further postings by SGS should he return ‘full-time’ to his thread on Spiritual Forums? Or do you think he’s maybe said all he has to say about the general issues that apply to us all? I would ask the last question of SGS directly but I don’t know where to find him and he’s not posting on SF nowadays as far as I can see….. If he should return and provide new information, I would certainly post it. For example, you will note on a few of the essays that I did add to the Comments Section, in order to include materials he shared the last time he returned, and which fit the theme of that particular essay. I haven’t had an in depth look at your compilations, Bob, but I did notice that you’d later posted extra material in some of them – thanks. We’ll just have to wait and see what he does in future. Prior to my assembling this blog, I was told by Sparrow that a former website had been created to communicate his answers to questions of a spirit nature, but had been taken down by the owner. I’m a little confused. I already had this address in my ‘Resources’ bookmarks as an active website. It looks similar to how I remembered it before but has it been updated in some way? I just moved the announcement from the main page to this section. Thanks for sharing the valuable information, Mac! Wonderful, didn’t read the ‘about’ page yet. I’ll offer some words from Robert Monroe for anyone who desires to have contact with guides as sparrow or the Asceleottyi. Joy to the Heart Love Lives, Emaho.